In the second part of this 2 part post, we move on from the theory about dating a non-Christian to the real situations we face. 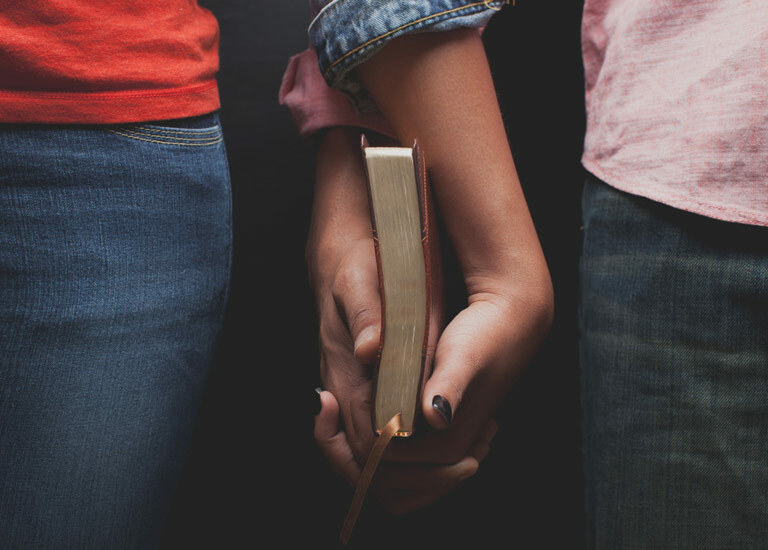 We look at specifically helping those of us who are dating or wanting to date a non-Christian, think it through in light of their hopes for a good and God-centred romantic relationship. In part one, we started to explore the question about whether we should date a non-Christian. (Read Part 1 here). Don’t just dump them right away because they’re not a Christian! So much damage is done in God’s name when we use him as an excuse for ending a relationship badly. But also, be careful that you don’t latch onto any evidence that says it’s OK to stay in the relationship. Some people do date a non-Christian who then becomes a Christian. It’s always wonderful to hear these stories, but what do they prove? Someone else’s story is not yours. We’ve seen (and experienced) relationships that have suffered from people not facing up to the facts. We understand how hard the idea sounds that God might not want you to date the non-Christian you’re with. So it’s natural to feel defensive. Watch that you don’t withdraw from your Christian friends because they might challenge you about your relationship. The bond of attachment between two people always becomes stronger when the relationship is under attack (perceived or real), so we always need to ask ourselves whether our desire to protect our relationship is giving us a false illusion of intimacy. We’ve known couples whose relationships moved from the ‘getting to know each other’ stage to the ‘really serious’ stage overnight, because of the criticism they received from family or friends. Are you able to share with your girl/boyfriend what following Jesus means to you? How do you feel about how they respond? Have you been defensive of your relationship? Why might this have happened? Who have you been defending this relationship from? Can you pray for your girl/boyfriend? Are you able to pray with them? Why or why not? Are you able to see this relationship clearly? Is there someone you trust, who loves you both, who could help you do this? Is this relationship healthy in God’s eyes? Who could you ask to help you explore this? Are you still growing in your relationship with Jesus? How might dating someone who doesn’t share your focus on God’s plan for your life and relationships help or hinder your ability to serve him? Would you be willing to end this relationship if you felt that this wasn’t the right one for you? Following Jesus means putting him first in your heart, so how will your boy/girlfriend who isn’t doing this feel about it? It might be easier to say than do, but it demonstrates a clear focus for her life – and focus brings freedom. Knowing her ‘yes’ is to God’s plan for her life will help her to know what and who else to say ‘yes’ or ‘no’ to. You need to be prepared for the cost that comes with staying in this kind of relationship or saying no to one. In the end, the decision of whether we date a non-Christian is about realising that we need to be wise with the decisions God allows us to make. You need to be prepared for the cost that comes with staying in this kind of relationship or saying no to one, but you can also be reassured that God is more than able to meet all of your needs. Our God keeps his promises. He knows that our loneliness or longing for love can feel so pressing, especially when there aren’t many (or any) available Christians on the scene to date. But immersing ourselves in him is the only way to make sure that this fear doesn’t dictate our decisions. We need to wake up to the heartache experienced by many Christian singles who would love to meet someone but cannot find many people of their age in their churches. Let’s meet their radical commitment to Christ by increasing our support of them. Imagine if, no matter what we decide, we learn to run towards God. I don’t know what you’re thinking as you read this, or what God is saying. I won’t pretend to. But I want you to think less right and wrong, and think about what kind of relationship you want, and who is best suited for building a relationship with. Imagine if, no matter what we decide, we learn to run towards God, and ask him to be a bigger part of our relationships. What can we do today, to make sure we bring him into our relationships more? Do you think that dating a non-Christian is easier, harder or the same as dating a Christian? Comments welcomed below.